ProSolv® pays for itself after recycling as few as 8 propane-cylinders. 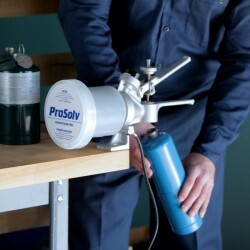 A ProSolv® system can depressurize and recycle 40 spent propane cylinders before its first filter change. Traditional disposal methods would require a disposal fee up to $100 dollars per each propane cylinder to handle as a hazardous waste, with a total cost reaching $4000 dollars. ProSolv® pays for itself after recycling as few as 8 propane-cylinders. 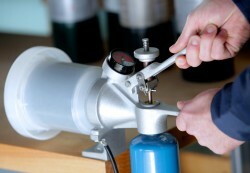 Spent pressurized propane-cylinders no longer have to be stored for hazardous waste treatment and handling. 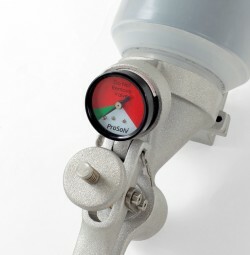 ProSolv removes the sealing sleeve and internal valve stem from propane, propylene, mapp and calibration gas cylinders, as it empties and filters the propellant. Furthermore, ProSolv® provides recycling certification tags for each canister recycled to guarantee pick-up by the handler. It’s the only technology of its type to certify the depressurized canister for recycling. It greatly benefits the environment by converting a propane canister into a recyclable steel container, thus diverting it from landfill. Recycling one small propane cylinder is equal to recycling one (1) pound of steel, which saves 5,450 BTUs in subsequent steel production.